40. wow. the idea of it takes my breath away a little bit. i actually vividly remember my dad's 40th birthday party when I was a kid. he was showered in gifts of geritol, walking canes, stool softeners and other old people stuff. black balloons filled the room where the party was and "over the hill" banners were everywhere......and now I am finding myself inching closer to 40 as every day goes by. the funny thing is....i don't feel old. do i need a reality check? or, is the reality that, 40 really is the new 30? i don't know if that catch phrase is true for me. i don't really want to be 30 again, even though 30 seemed pretty darn great. the reality for me is that 40, although scary on one hand, is also quite exciting on the other hand. i feel like, having gone through the weeds with my recent divorce, i am starting a whole new chapter of my life. one where i actually love the person i am for the for the first time in my adult life. i have earned the little lines that are starting to form in the creases where i smile from all the laughter and joy, and earned the lines in the corners of my eyes from every struggle. i have earned the snow white hairs that are starting to magically appear on my head....they come with the years. with all the joy......and all the struggle......and all the resolve....i am in a weird way a bit fond of them...(even though i will not give a second thought to making an appointment with a colorist, if they continue to be fruitful and multiply). •i will start taking care of my skin. i haven't done anything other than wash it, when i remember to for my entire life. not smart. this changes now. i will go on the hunt for my favorite skin care products. •i will be gentle with myself and treat me with the same kindness and respect that i show to others. •i will start being more conscious of what i put into my body and make a more concerted effort to feed myself with things that are good for me. •water. i will drink more. lots more. •sun. i love the sun and a sun-kissed glow makes me simply feel better about myself....but it can come at a high price that i am not willing to risk. i have already lost so much to melanoma. i will get my spray-tan on and start hunting for the best self tanner. •i will make fitness a lifestyle choice and start incorporating it into my life wholly. •i will say "yes". i can talk myself out of almost anything with my self-doubt. when someone includes me in something i will try my hardest to say "yes". adventures await. although both of our lists are different, they both recognize that this is an important, point in our lives and it calls for change. 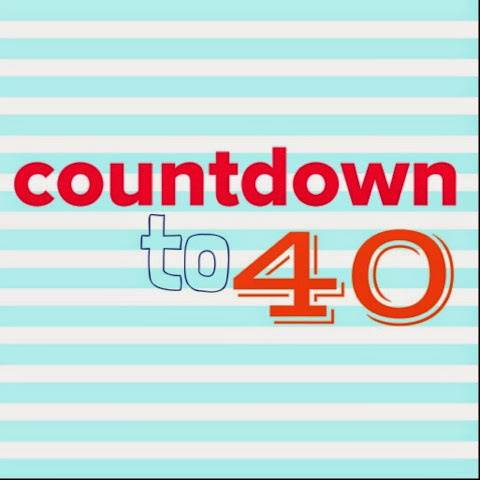 we are looking forward to sharing with you our adventures in #countdownto40 which will culminate with us meeting in houston, texas in december to celebrate our birthdays together. looking forward to sharing the journey with you all! how about you? did you do something special for your 40th? is that year more significant than others?